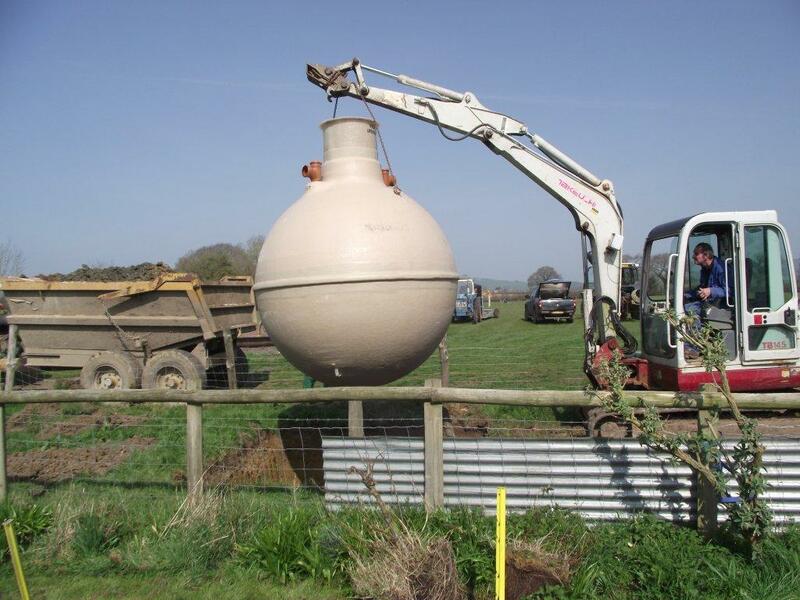 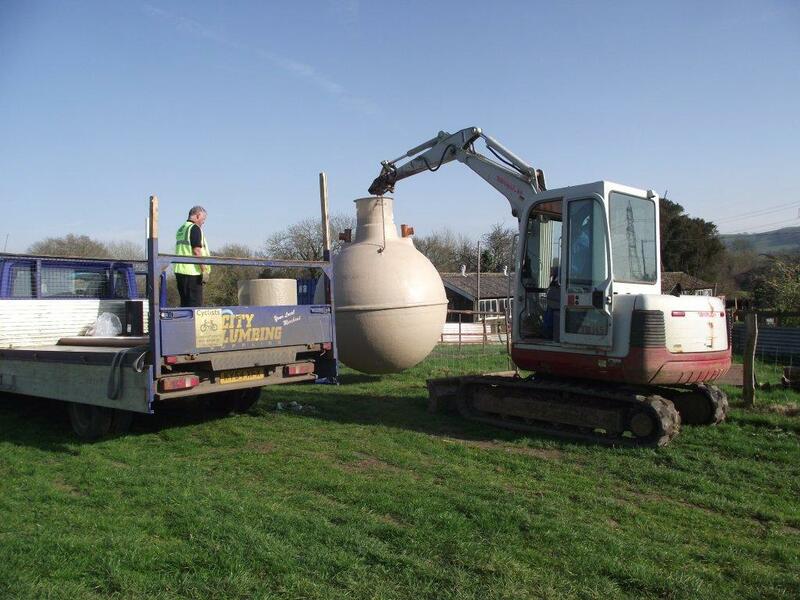 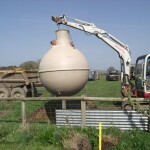 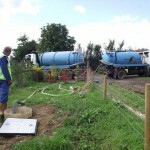 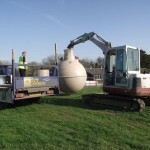 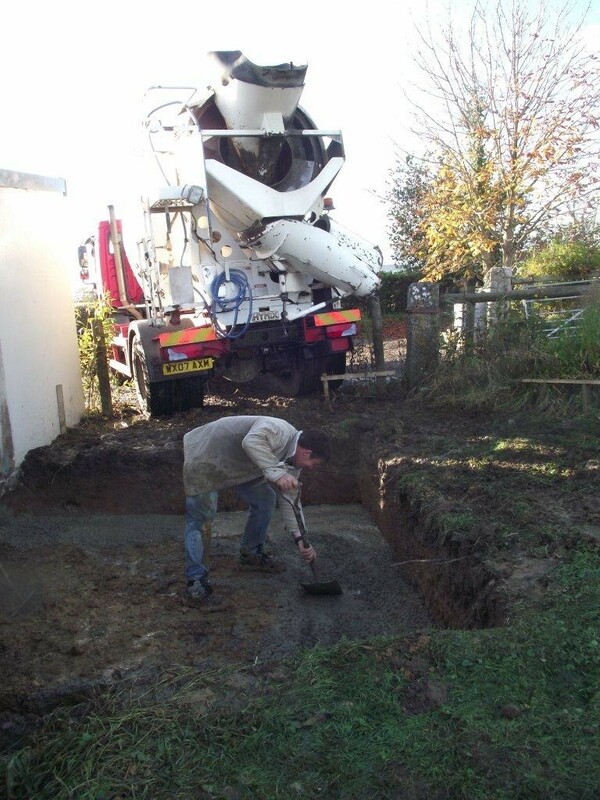 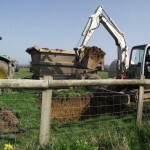 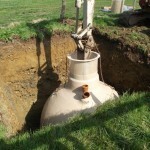 Another large sewerage onion was lowered into the ground in February to cope with the waste on the campsite. 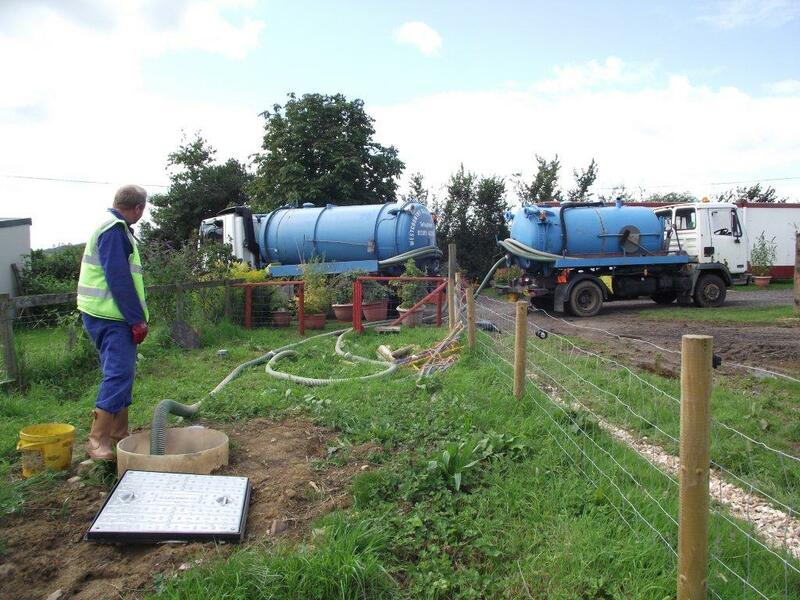 The sewerage disposal lorries were frequent visitors during the height of the season. 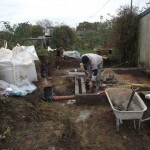 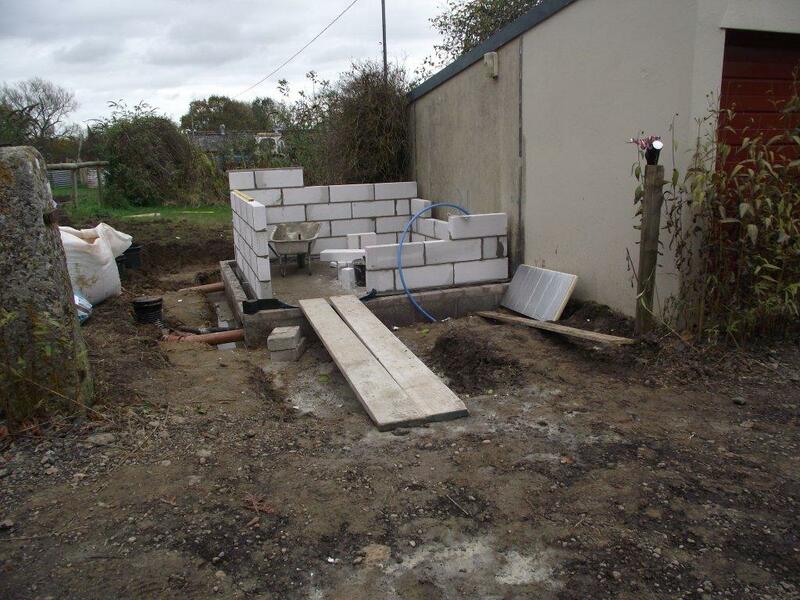 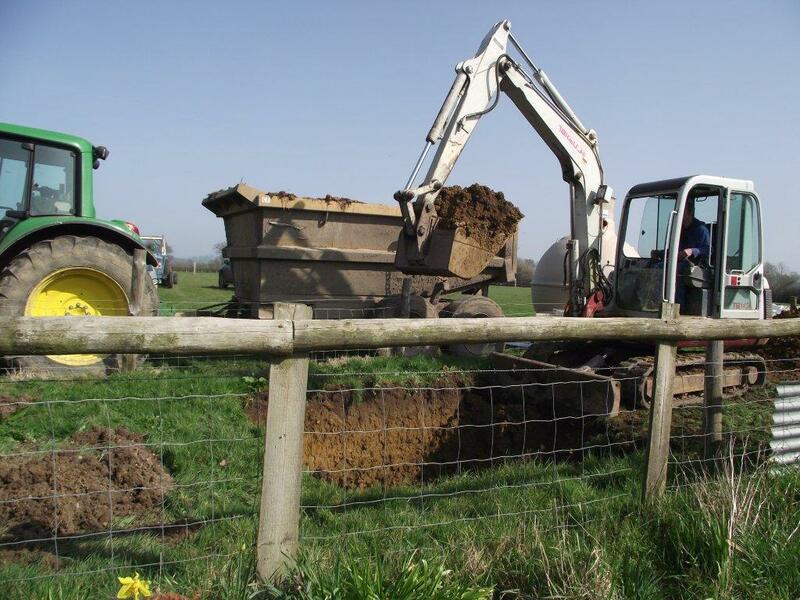 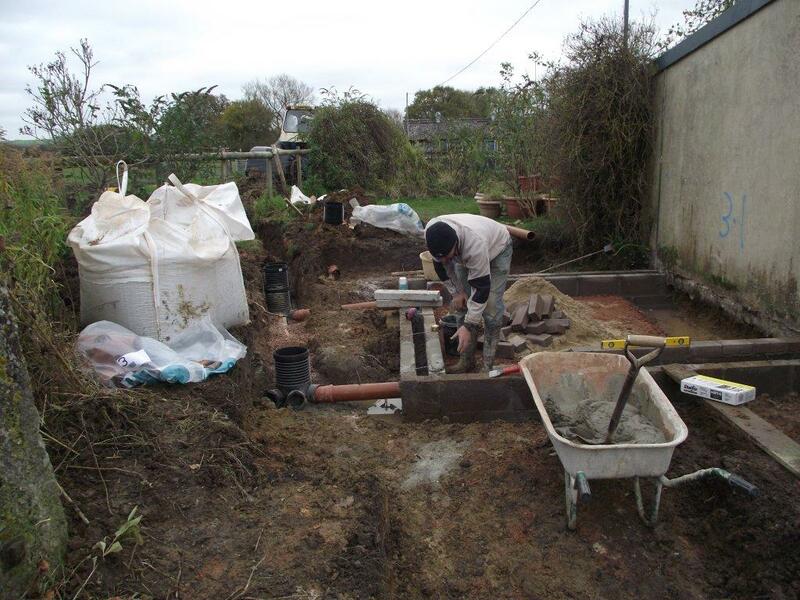 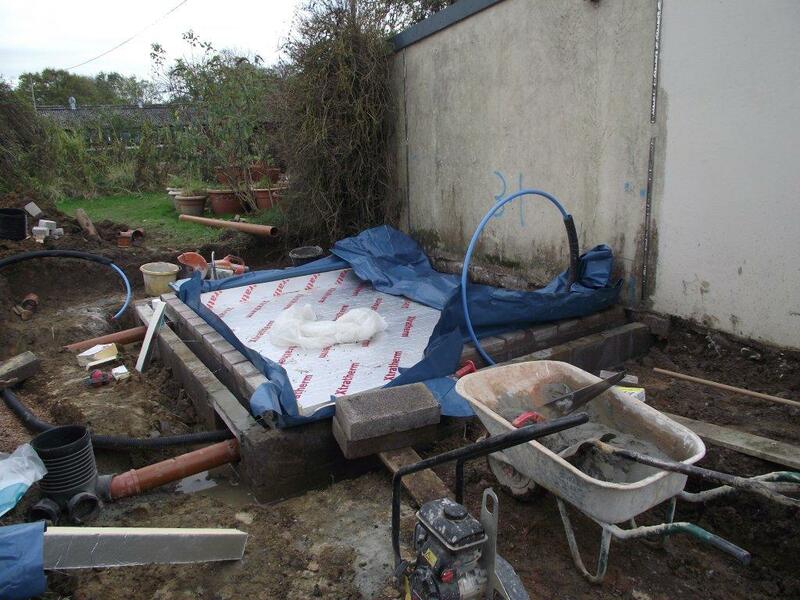 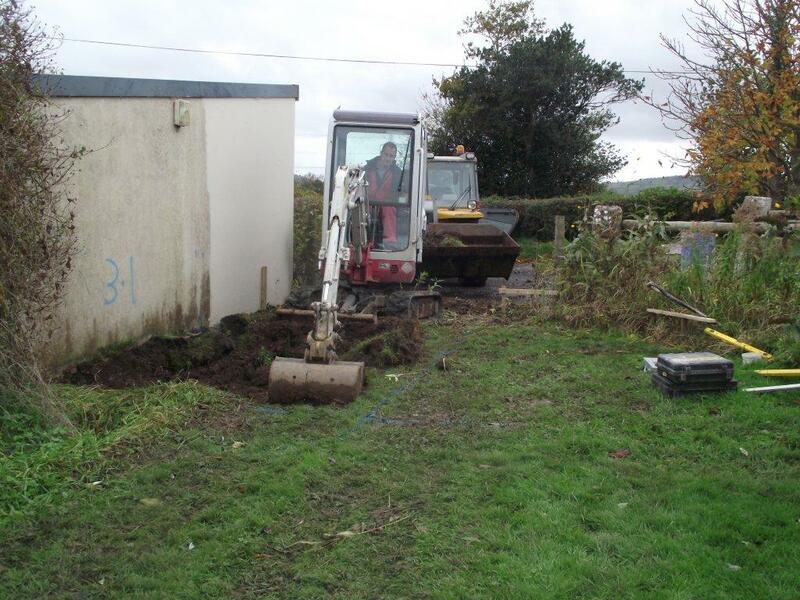 A disabled toilet was supposed to be built and ready for the Jubilee weekend, but unfortunately because of delays in every direction the first soil was not removed until October 2012. 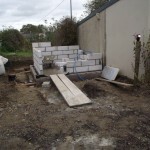 The building is attached to the garage so it meant that part of the lawn and flowerbeds had to be removed. 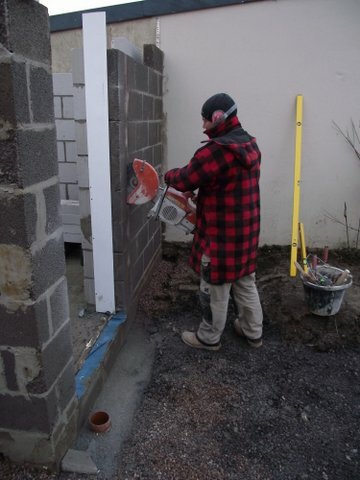 At quite a late stage it was realized that the door space would not be wide enough for a big wheelchair, so some of the wall had to be cut off. 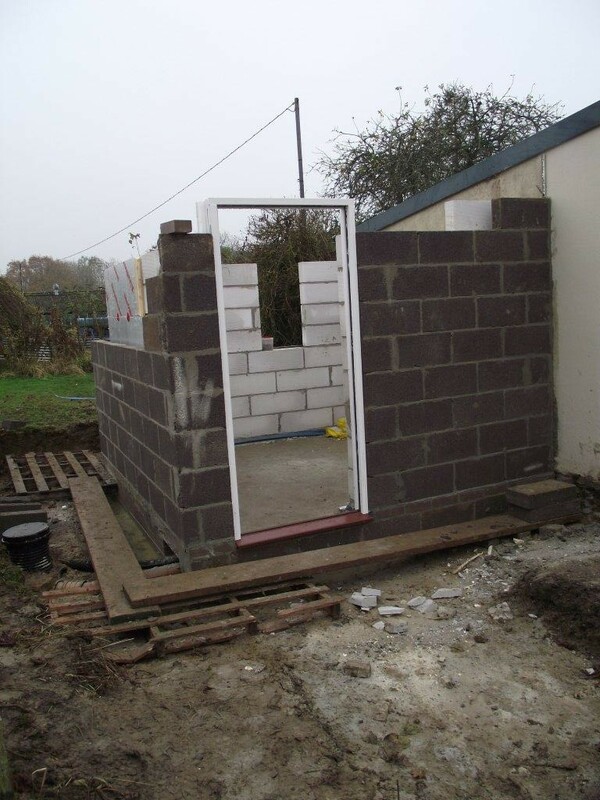 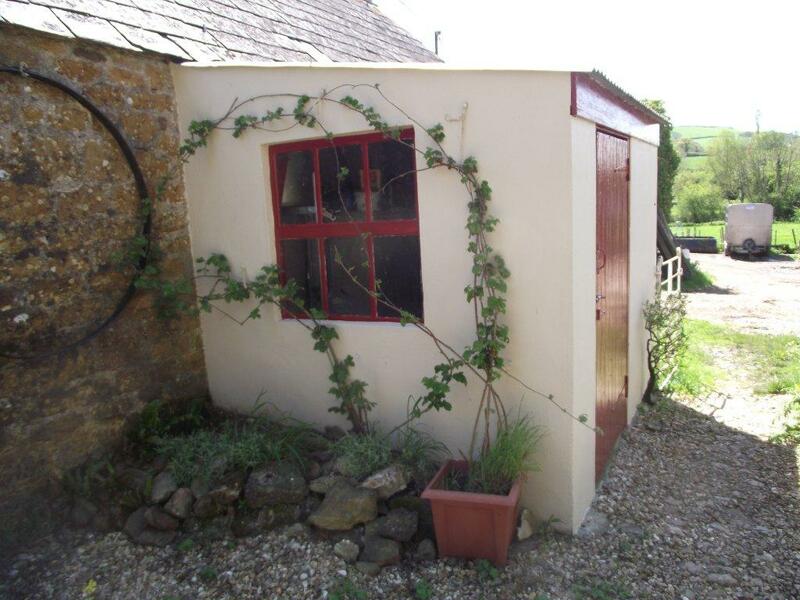 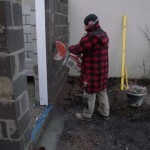 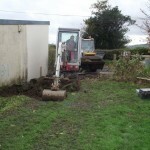 Hopefully the new door will be in place, the walls rendered, and the garden banks tidied up before Easter 2013. 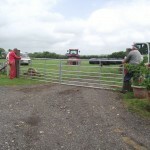 Two large double gates were put at the entry to the second field adjacent to the campsite, so that access to this area would be easier in the height of the season. 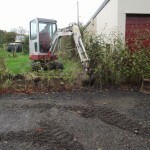 Road planings need to be spread on the hard standings and drive way on the site on a regular basis. 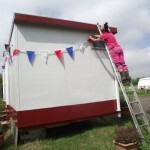 ( 1 photo) Clare, my handylady painted everything in sight, including the cabin. 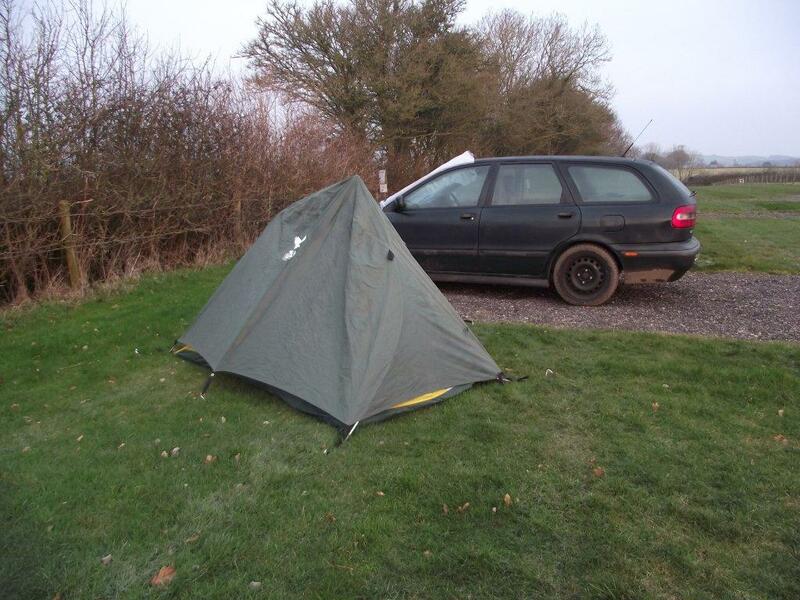 The bravest camper this year was someone who pitched her tent in the frost in February. 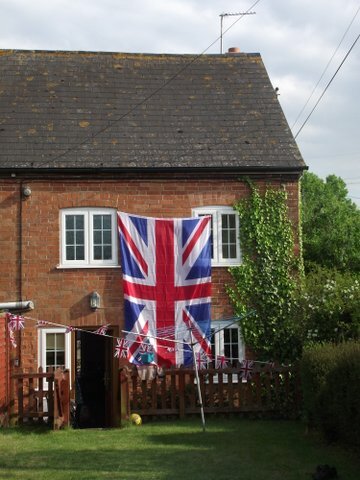 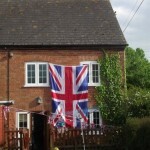 The Jubilee weekend proved to be popular for the campsite. 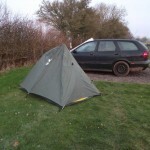 In fact I had to turn a lot of people away who tried to book at the last minute. 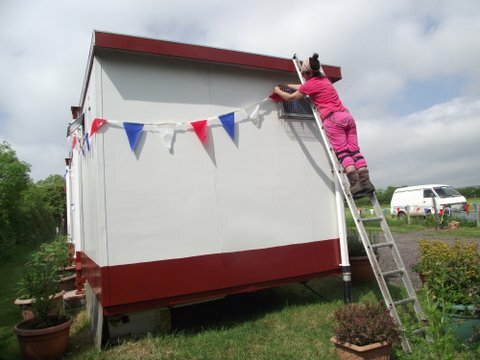 We decorated the site and the house, and several caravanners decorated their immediate area. 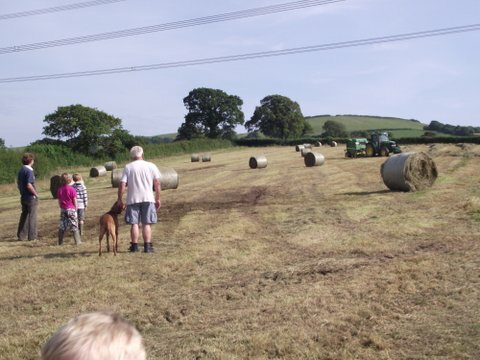 The conservation walk proved as popular as ever, sometimes walking through a hayfield during haylage making. 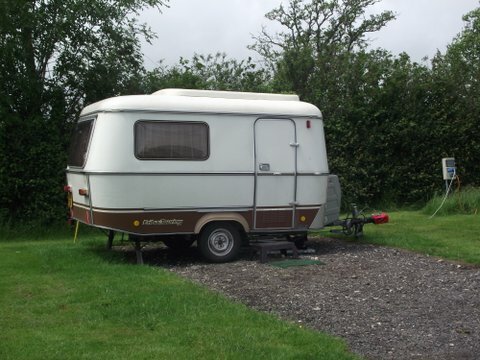 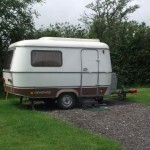 The most unusual caravan on the site during the year was an Eriba. 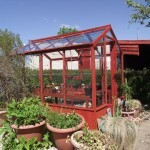 The first one was conceived in 1957 and has a tubular steel frame as the skeleton of the structure. 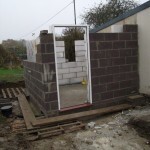 This provides a rigid secure foundation. 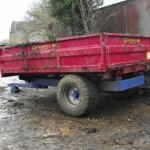 They are both aerodynamic and easy to tow, being light enough to handle manually. 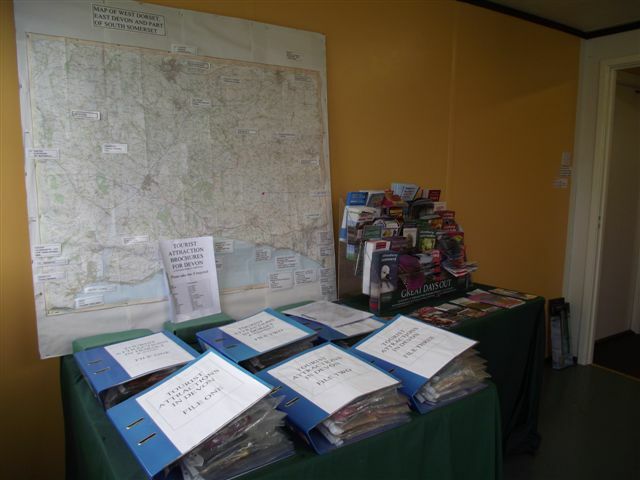 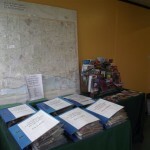 The tourist information in the kitchen area of the cabin was extended in 2012 and has leaflets from many places in Dorset, East Devon and South Somerset which proved popular with campsite users. 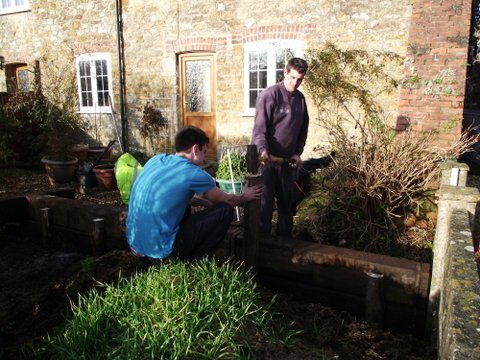 To make more garden space we made a raised garden, and filled it with cow manure, in the front of the farm house so that I can grow pumpkins and marrows later on this spring. 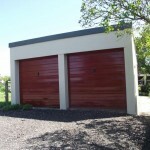 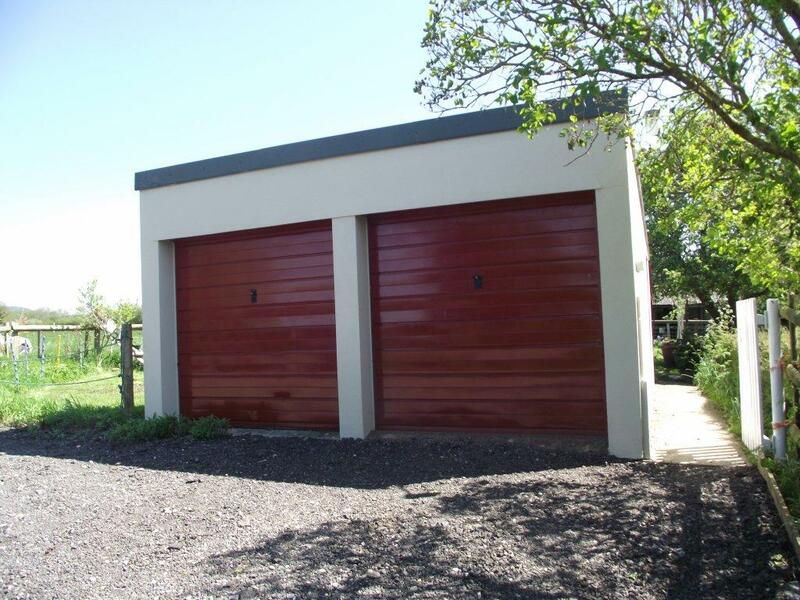 Clare did more painting around the house and garden and smartened it up with Simon doing repairs around the garage door. 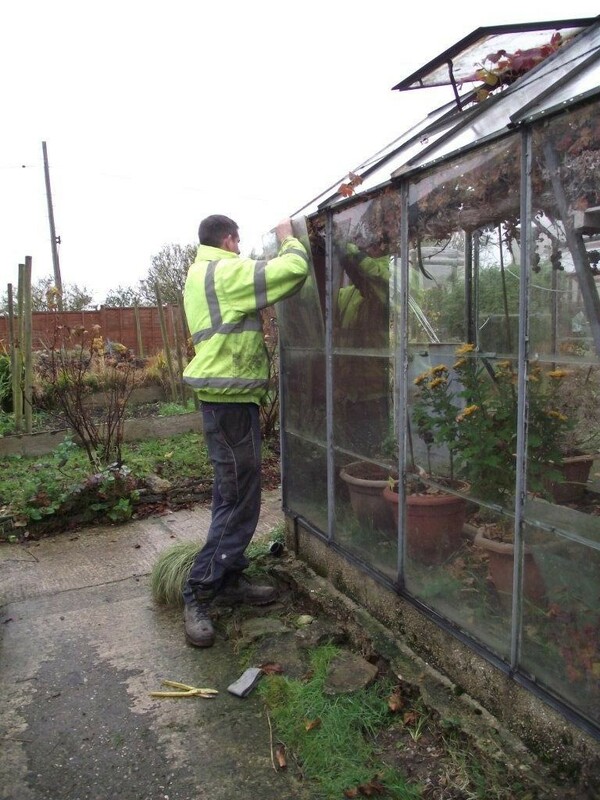 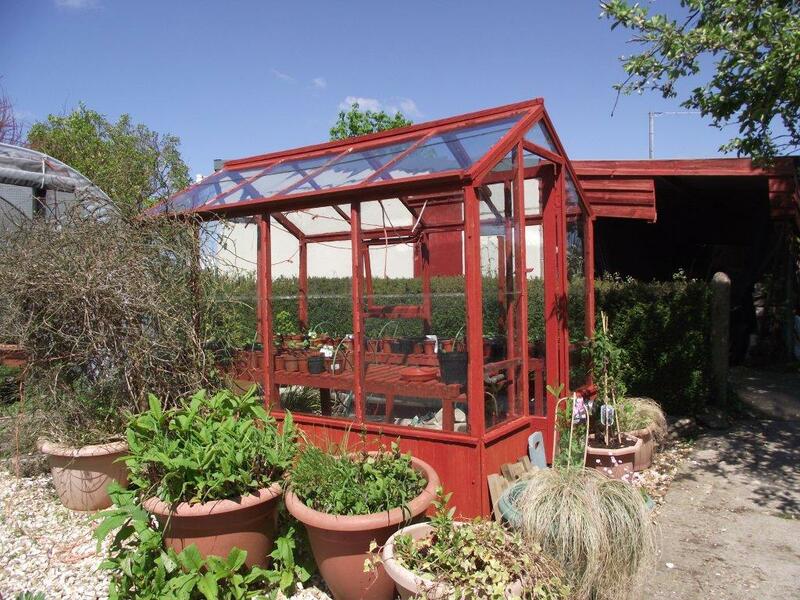 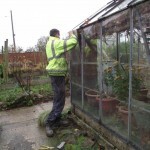 We also had to replace glass to the one of the greenhouses, which seems to be an ongoing problem. 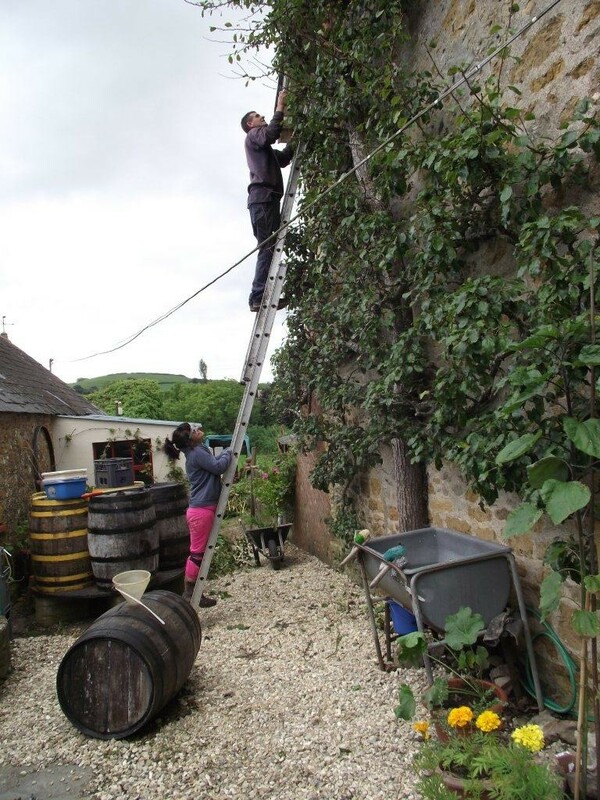 Pruning the pear tree attached to the farm house wall is always a traumatic job with extra lopping in 2012 as it wasn’t completely pruned in 2011. 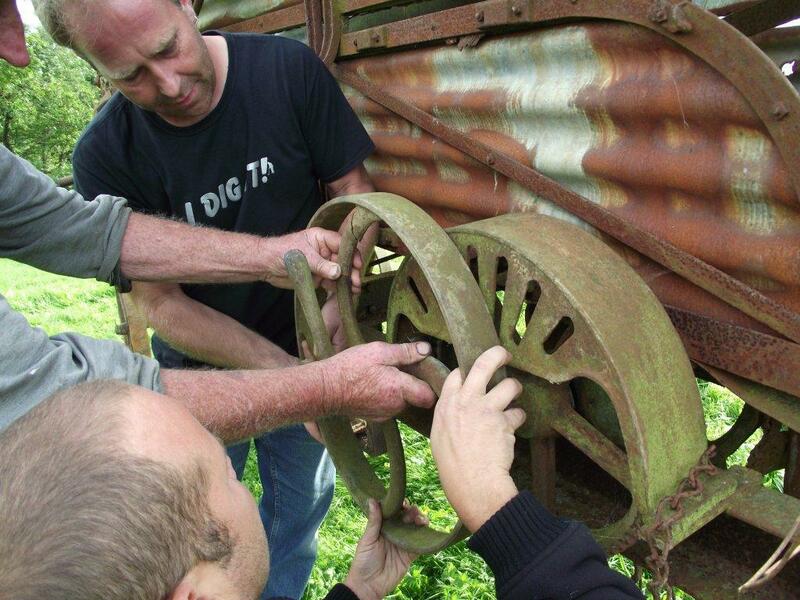 We have enough historical items on the farm to start a museum (which is a thought for the future). 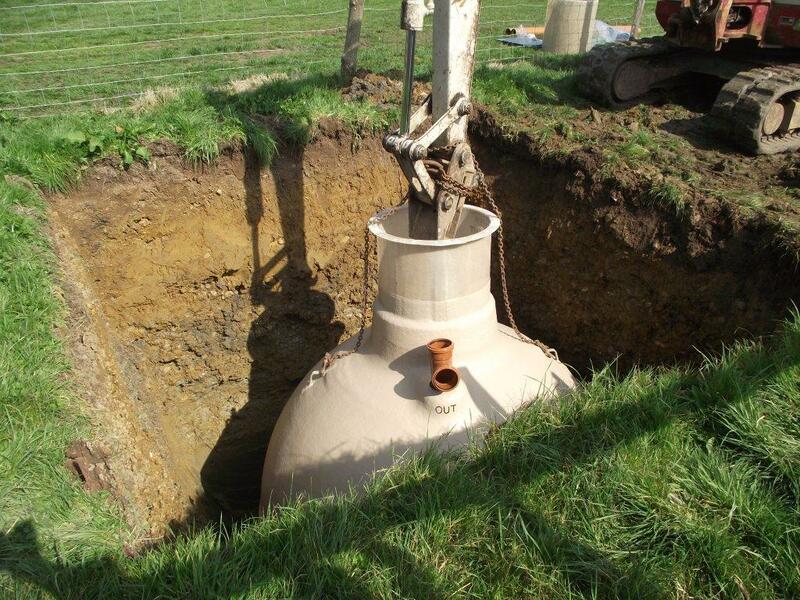 We decided to put an old grinding stone next to the old dairy as a feature. 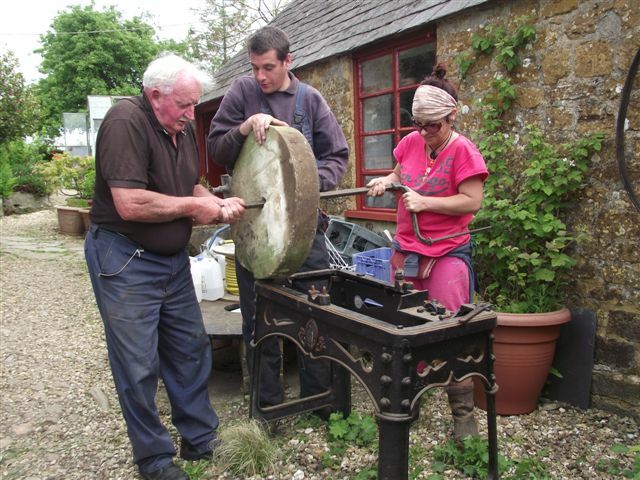 My father spent many an hour sharpening blades at this stone. 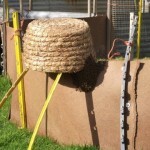 2012 was also a good year for taking swarms of bees. 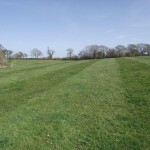 The bee site is mown regularly, but sometimes need a strimmer to do along the edges to keep it tidy. 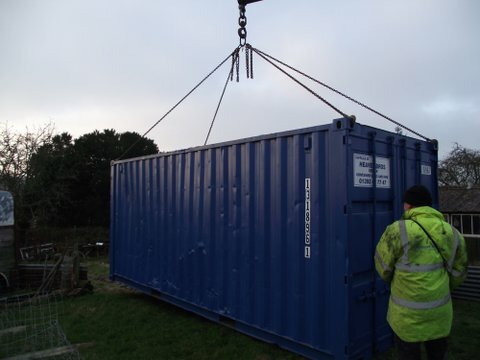 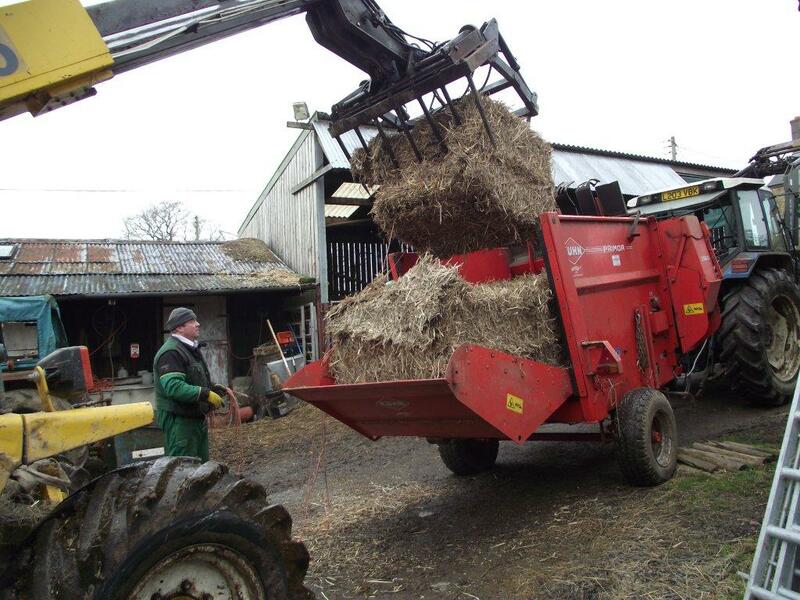 In February a container was delivered with the purpose of filling it up with valuable relics from the farm at some time. 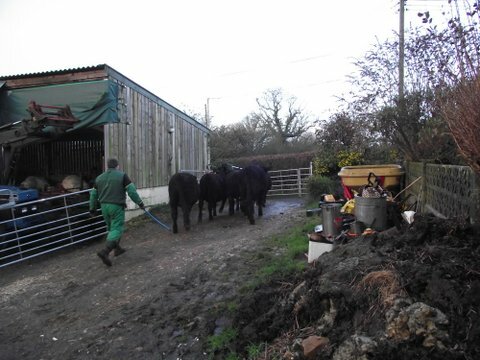 The animals have to stay in the covered yard during the winter and early spring so that the clay soil is not trodden and the meadow plants spoilt. 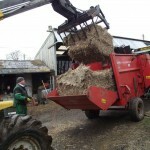 They have to be bedded down on a regular basis in the covered yard and their feeder always has to be topped up with hay or silage. 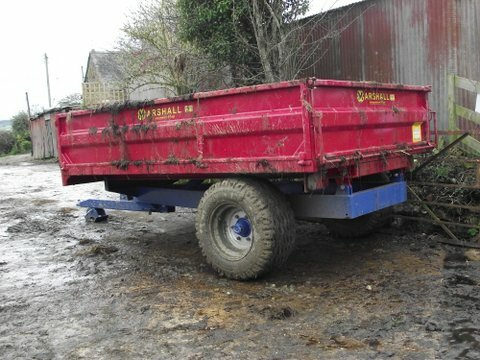 The yard is scraped out every day and a new trailer was bought to take this away to another site. 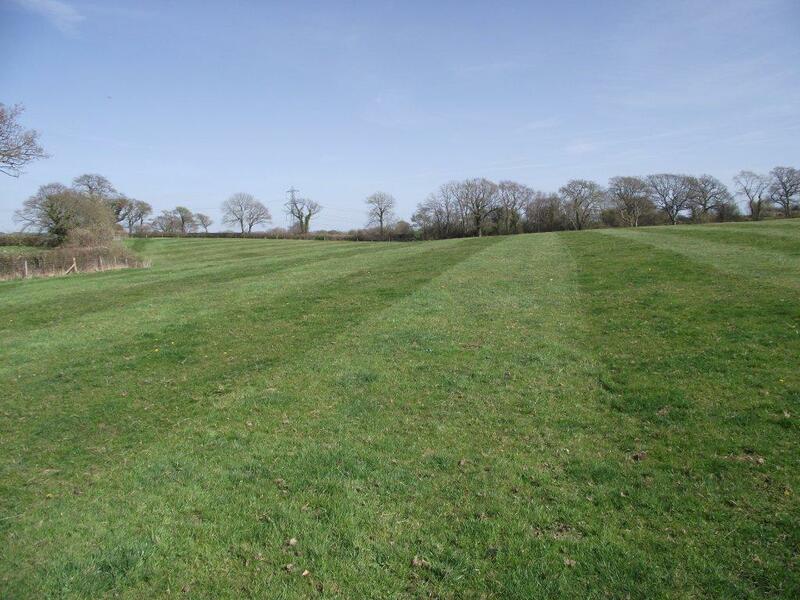 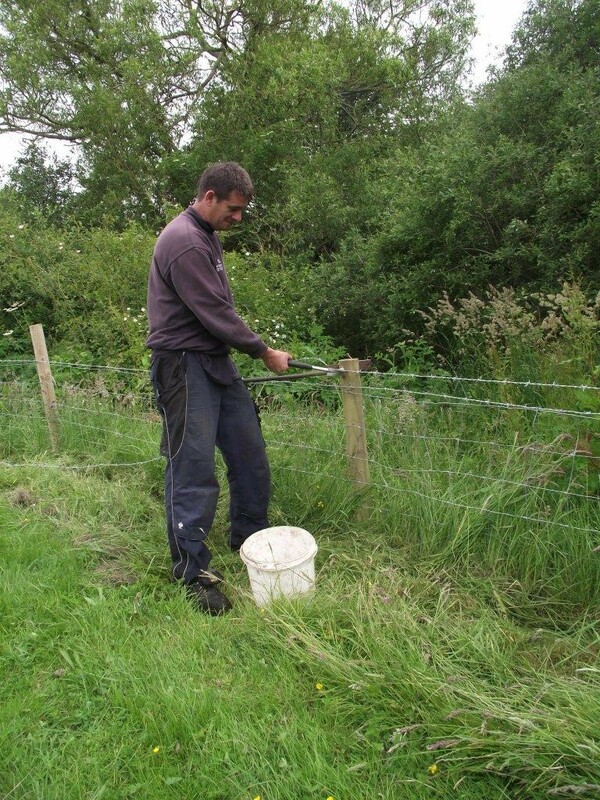 In the spring the fields need to be chain harrowed in order to aerate the soil, tear out decaying vegetation, break up creeping plants and fill in animal footprints. 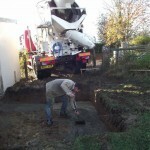 The ground has then to be rolled which consolidates and levels the surface. 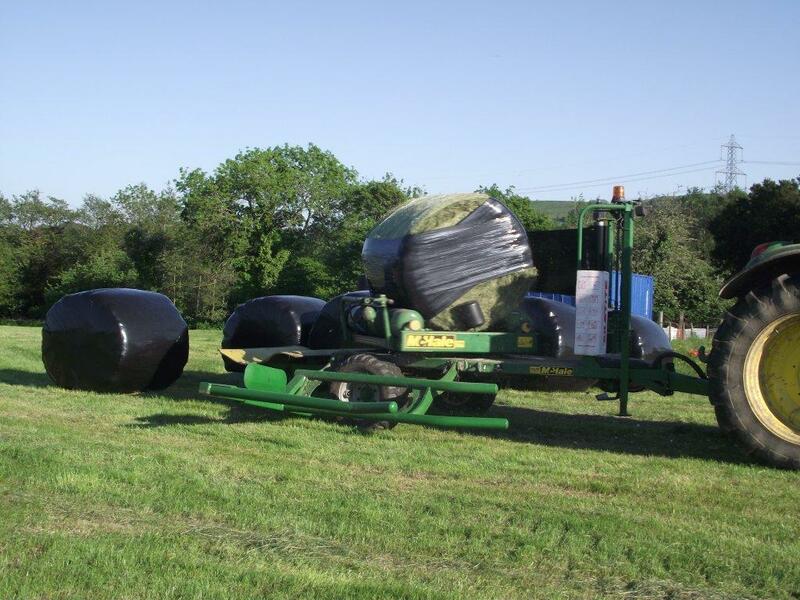 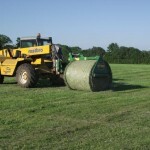 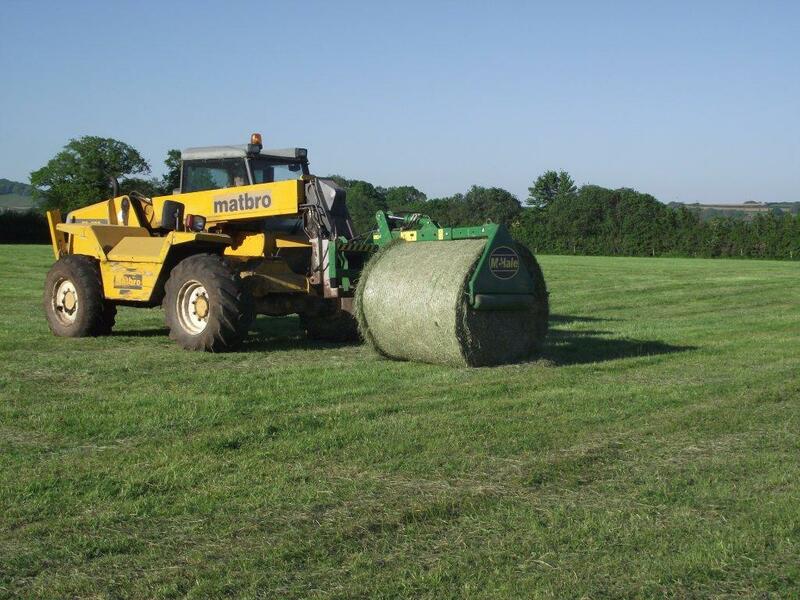 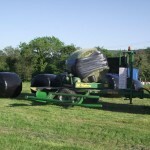 This will allow for better conditions for hay and silage making. 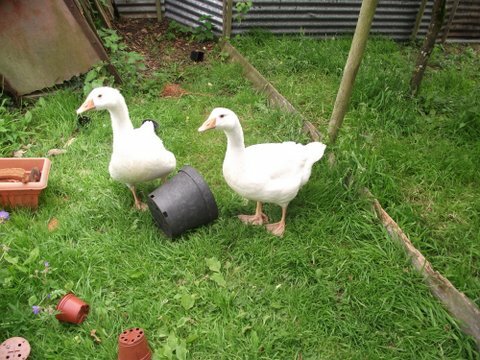 This year was different in that I had to pick up my goslings when they were only 1 day old (on 25 April), instead of 3 weeks as I have done in the past. 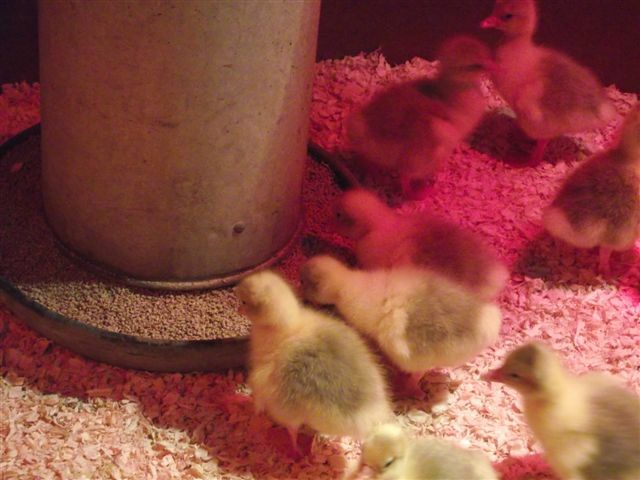 It meant that the goose house where they were to live had to be made rat proof and a circular band of hardboard had to be placed near the centre under the heat lamps so that the goslings would keep warm enough. 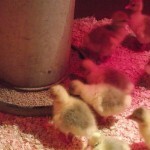 As is normal young goslings do not eat or drink until they are 2 – 3 days old. 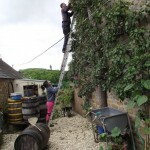 As they grow the handboard band is expanded outwards. 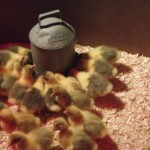 The shape also prevents goslings panicking and rushing into sharp corners. 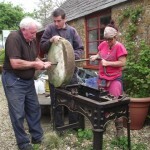 Eventually the circular band is expanded to take up the whole space in the goose house. 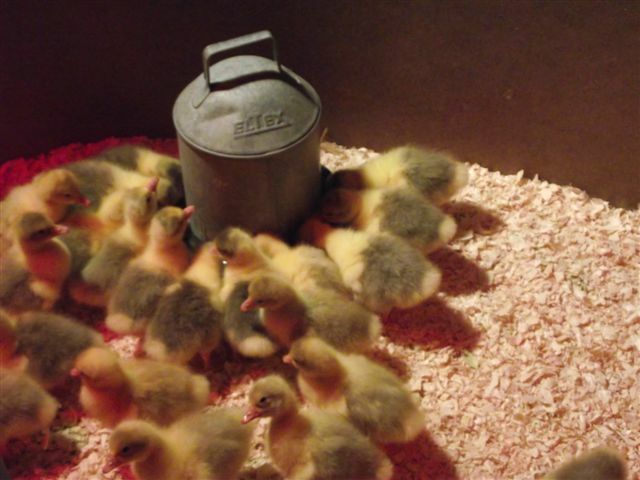 Unfortunately after about 10 days I noticed that one gosling was quite a bit smaller than the rest which meant that I had to rescue it from the others before it was trampled to death or bullied. 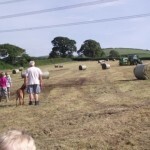 It then lived in a hay box with one of the bigger ones to keep it company. 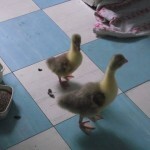 They used the bathroom floor for exercise. 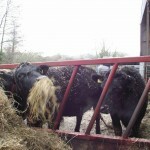 I weighed them on kitchen scales for three weeks. 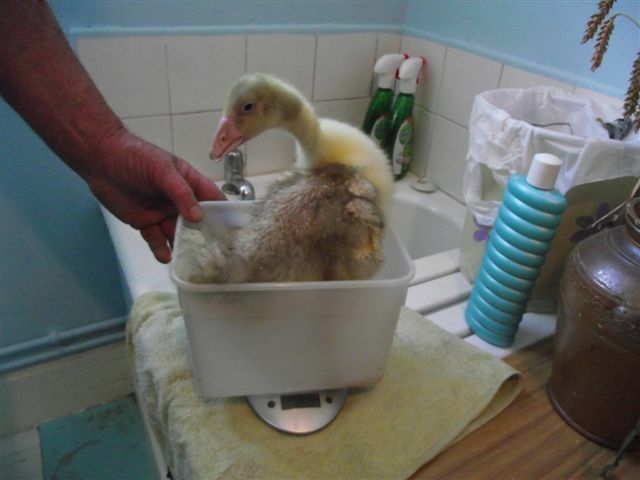 On 5 May Bobo the small one weighed 155g with Fred the bigger one weighing 391g. 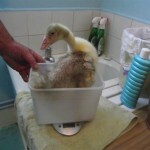 By 12 May Bobo weighed 360g and Fred was 740g. 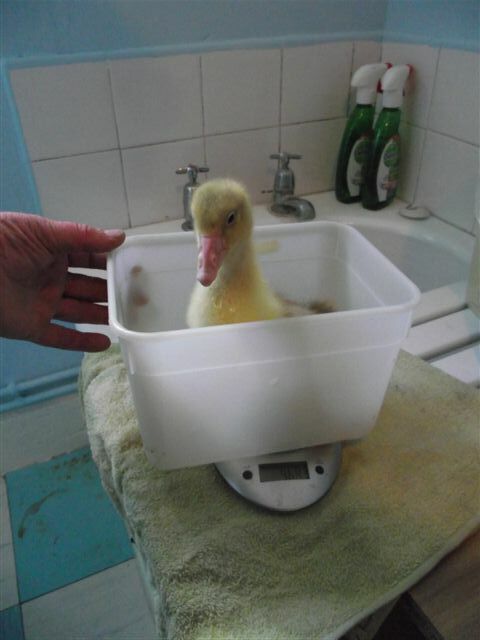 By 20 May Bobo was 784g with Fred being 1233g. 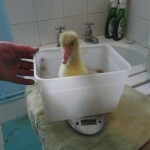 After this date I was unable to weigh Fred as my scales couldn’t cope with anything over 3 kilos. 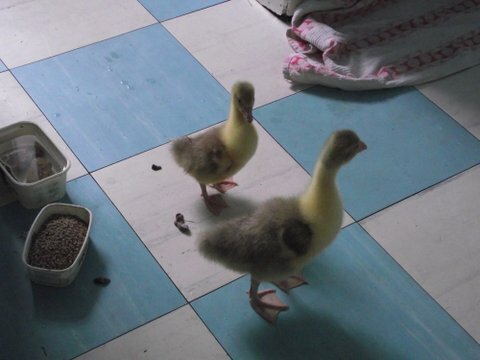 It took about 2 ½ months for Bobo to be roughly the same size as Fred. 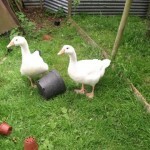 When they were about 3 ½ weeks old and feathered up enough they went out to grass in a run. 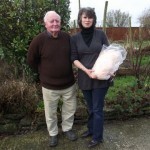 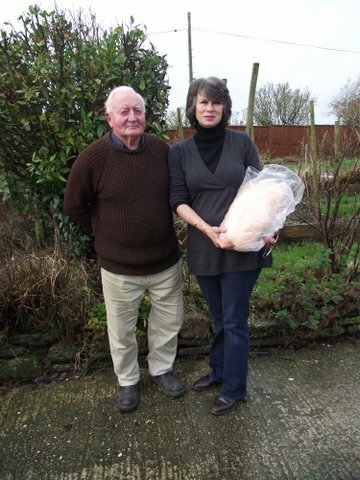 I had orders for all my geese by 1 December and the biggest one was collected on Christmas Eve. 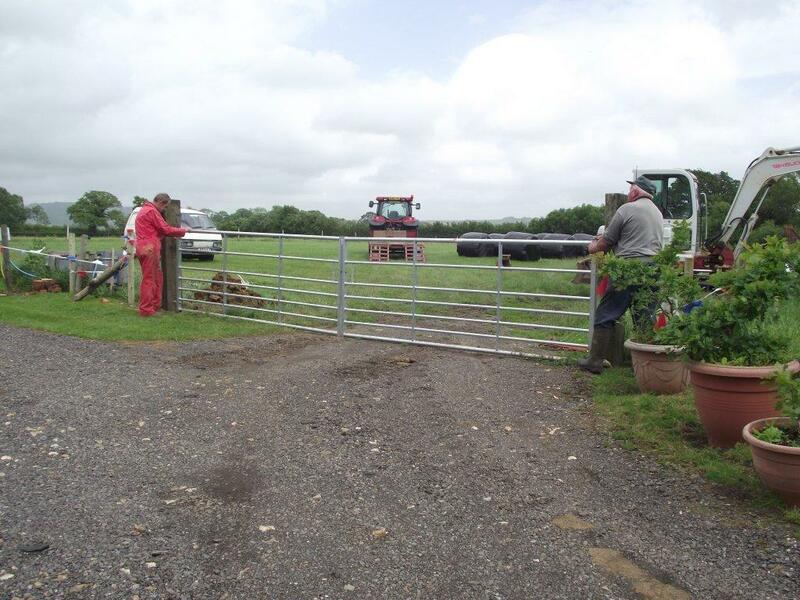 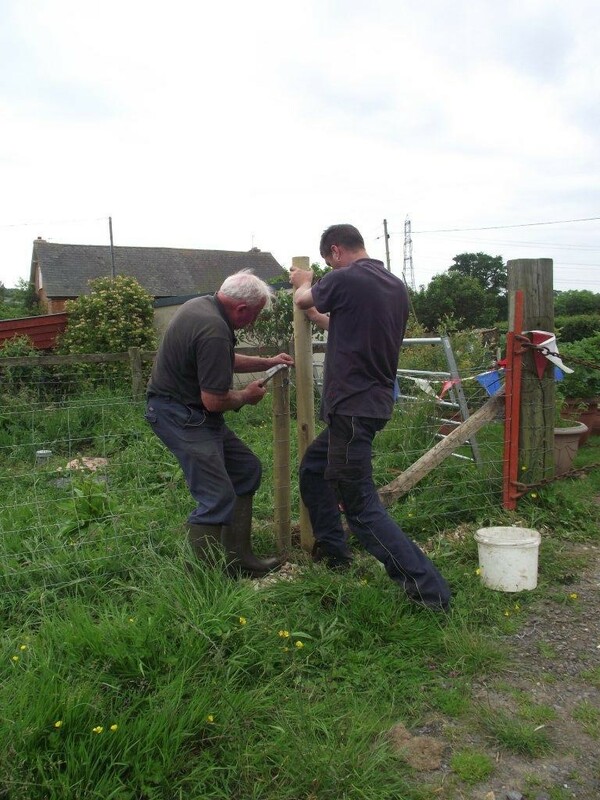 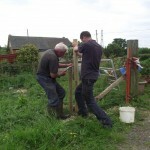 As usual there is always maintenance to be done around the farm and new fencing had to be put up after the sewerage onion was put it. 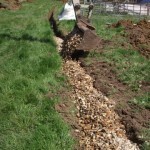 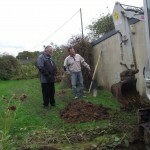 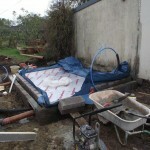 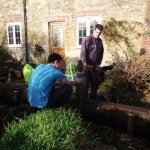 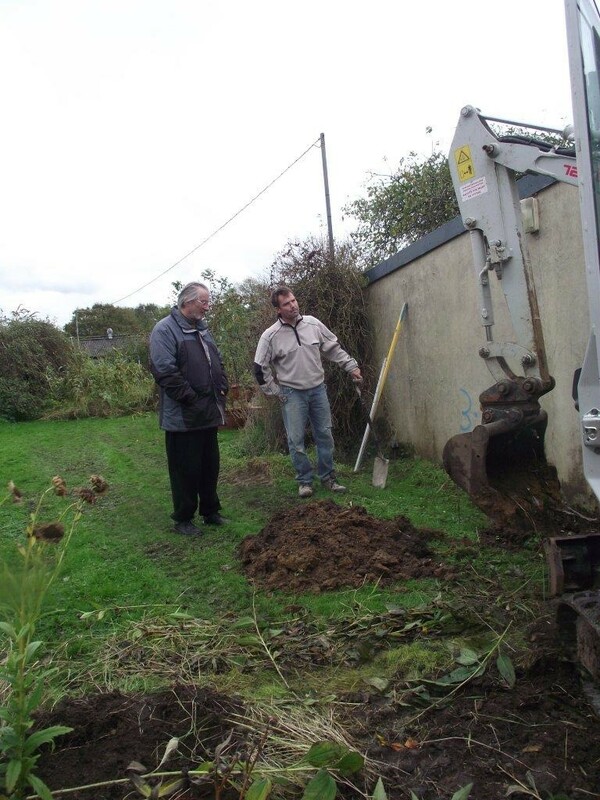 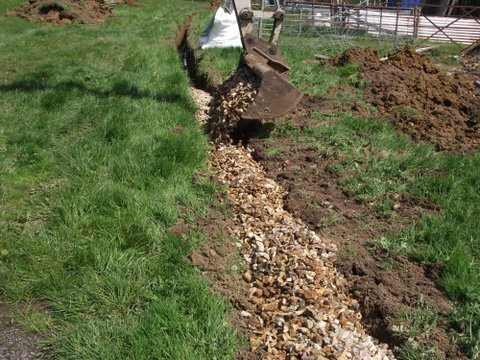 We also dug a trench in the same area to drain away water to a nearby ditch to stop flood water getting into the house. 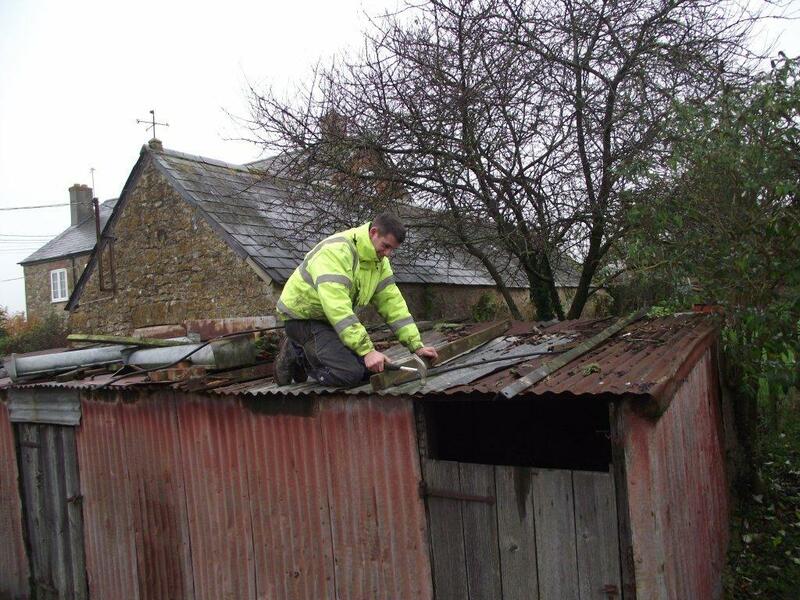 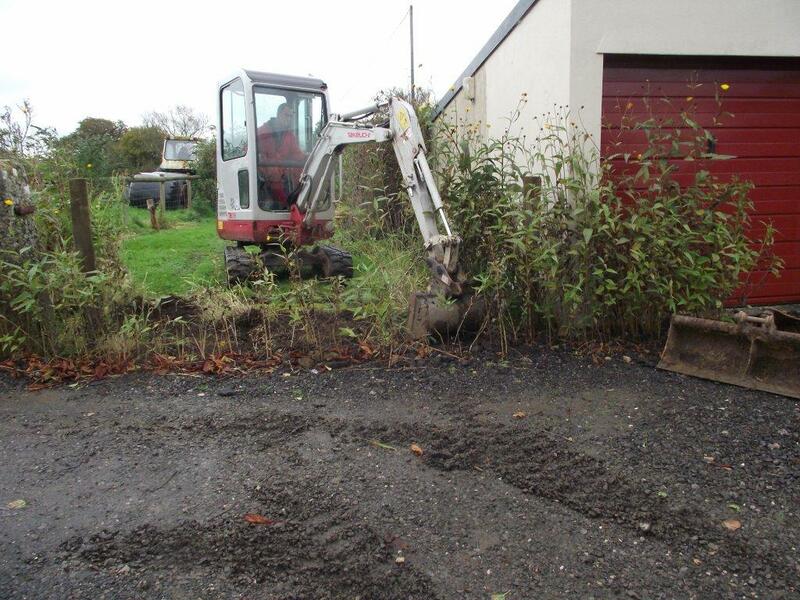 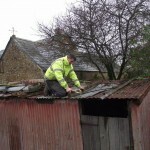 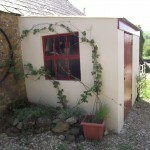 A very old shed, which should be pulled down, had its roof repaired as a short term measure. 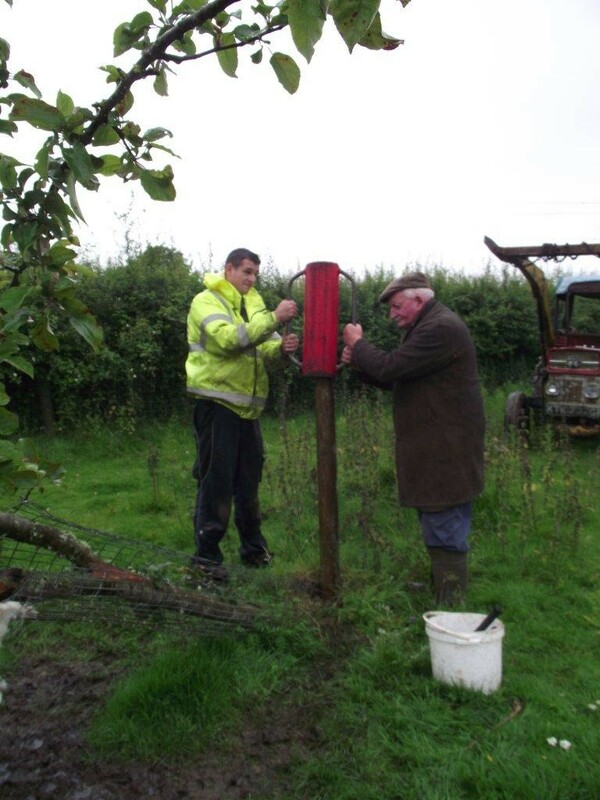 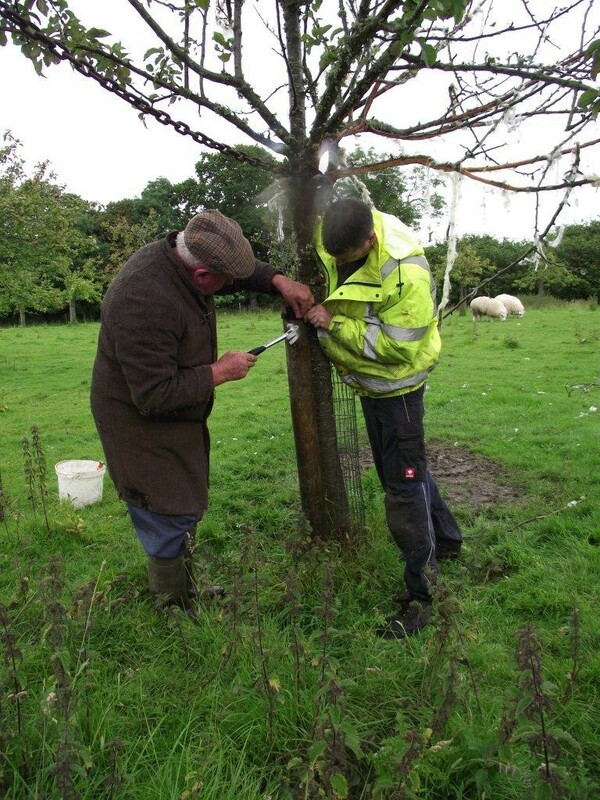 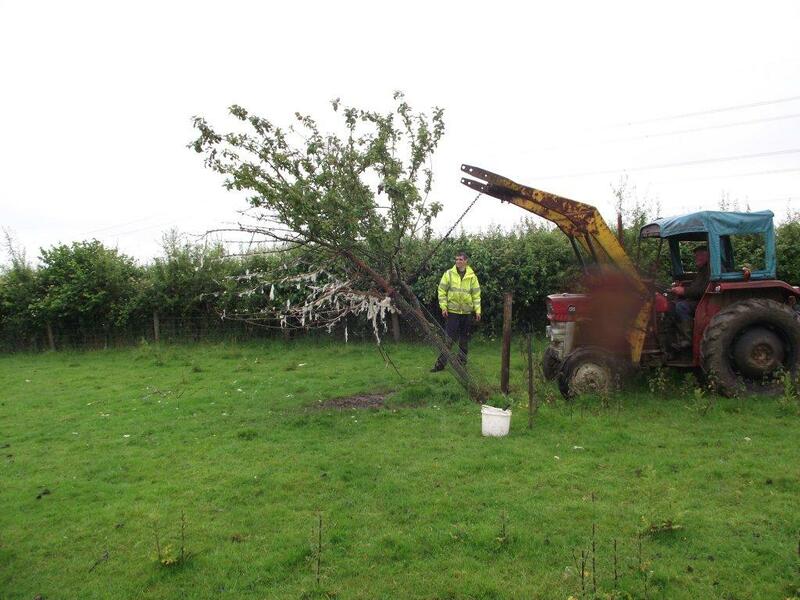 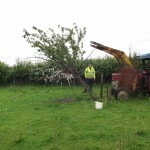 A young apple tree in our new orchard fell over because of a broken fence post, so that had to be pulled up with our old tractor and referenced and protected from sheep. 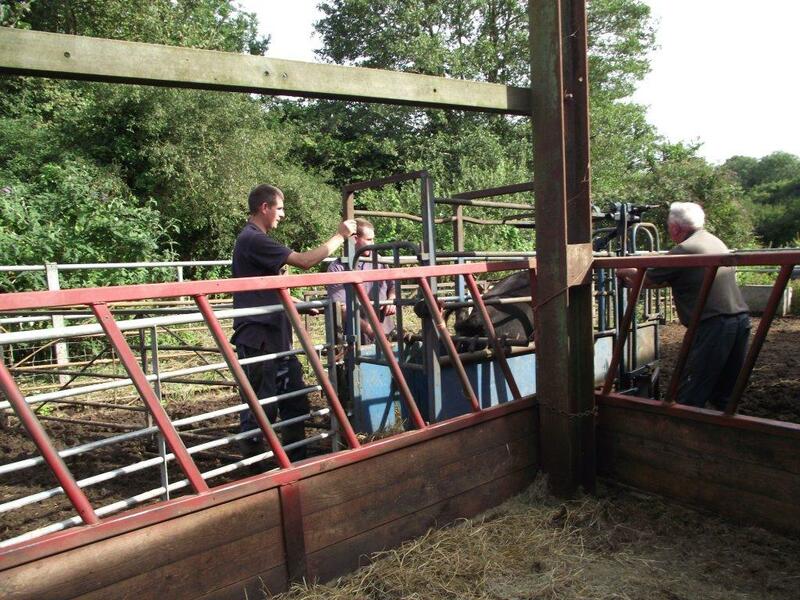 Cattle always seem to losing their ear tags (each animal needs two) so we had to put them through a cattle crush to get the job done. 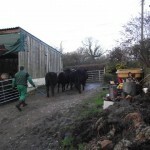 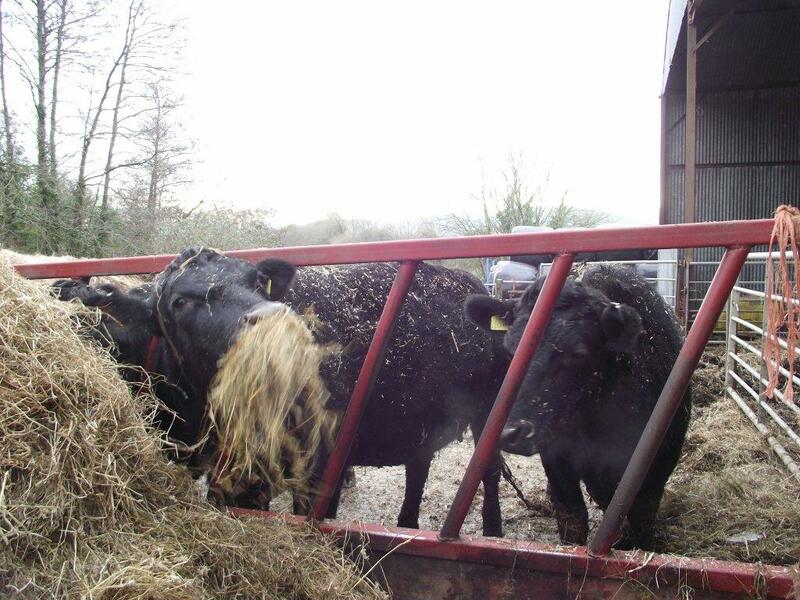 Later on, just before Christmas, these same animals were sent on to market consisting of 4 steers and 2 heifers. 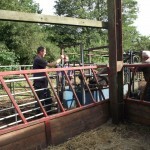 The sheep continue to thrive, and need to be drenched on occasions and we had a good lambing percentage in 2012. 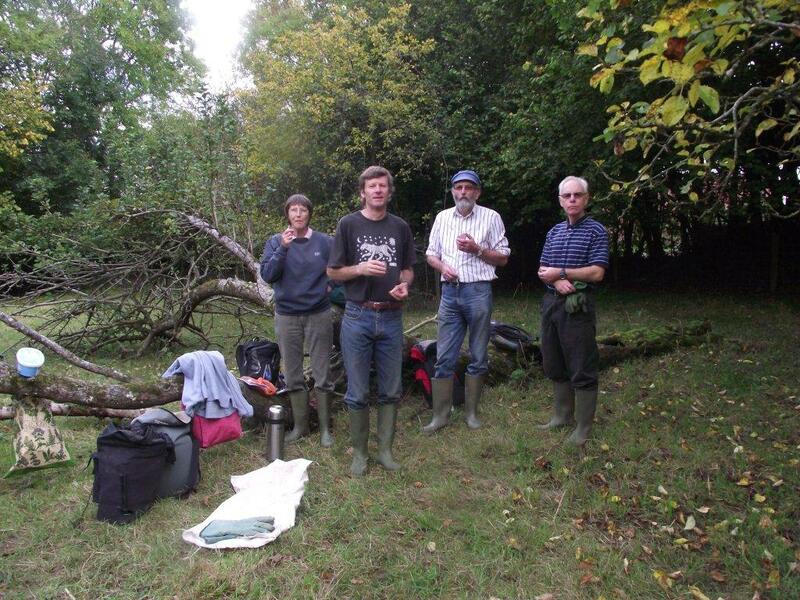 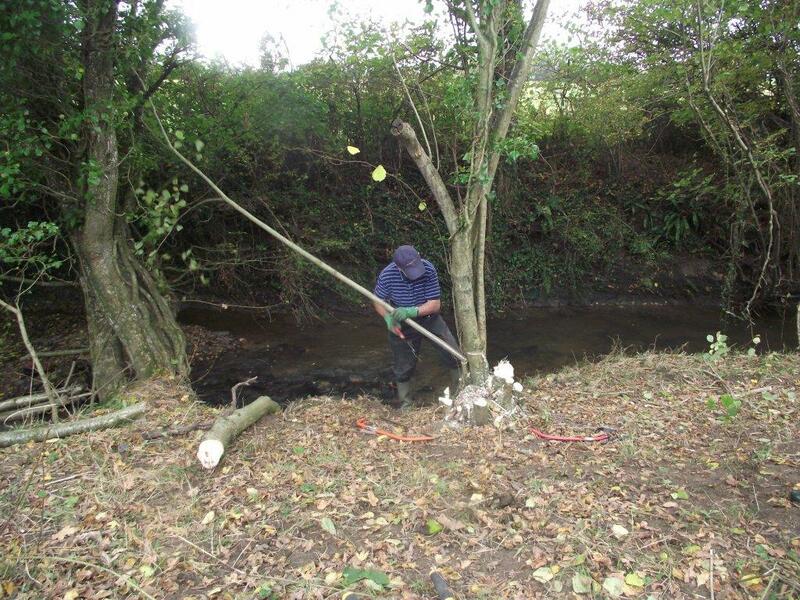 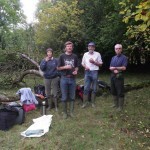 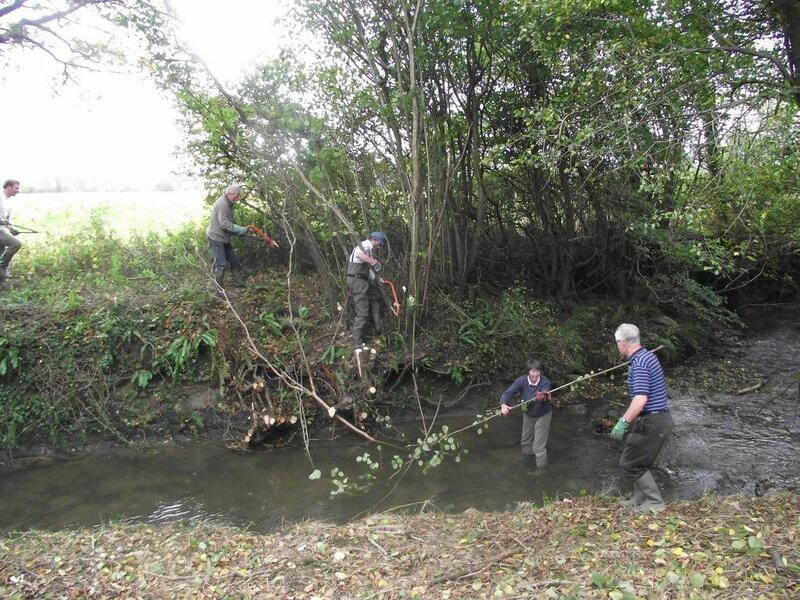 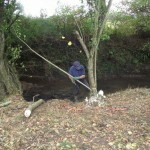 The Dorset Wildlife Trust were kind enough to volunteer to clear some overgrowth from the River Char, on the edge of one of our orchards so that more light could be let in to encourage more wildlife in the river. 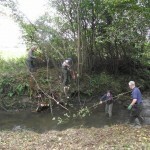 Unfortunately the River Char has been in flood several times during the year which overflows into the sheepwash. 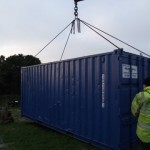 In trying to move an old elevator so that it could be viewed from the campsite as a feature it unfortunately fell over sideways and the flywheel was broken. 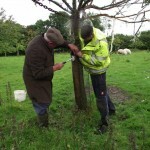 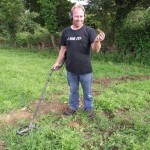 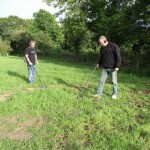 We were unable to find the missing pieces so we had to enlist the help of some local metal detectorists to locate them. 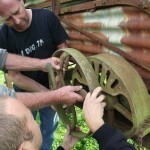 The pieces were found in no time and we able to piece it all together (but it has yet to be repaired). 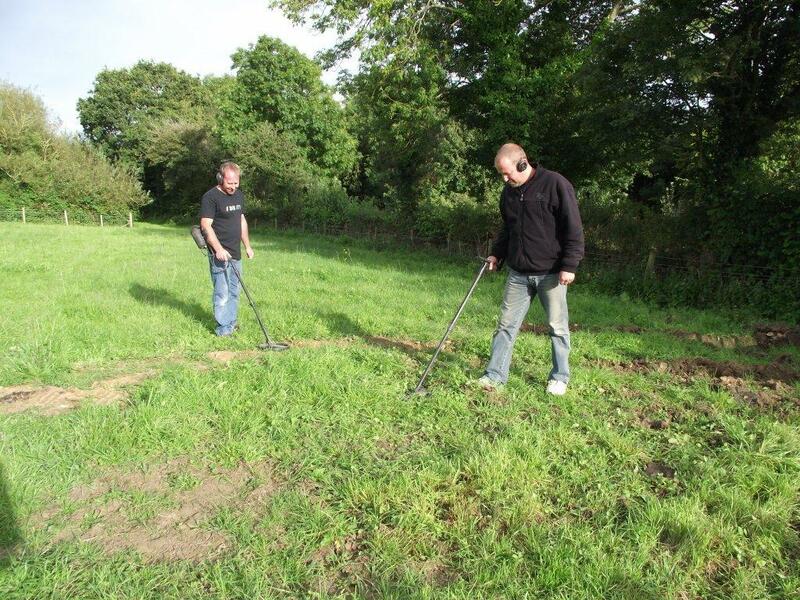 Later they did some detecting work in our rick barton and came up with a Victorian and Edwardian find. 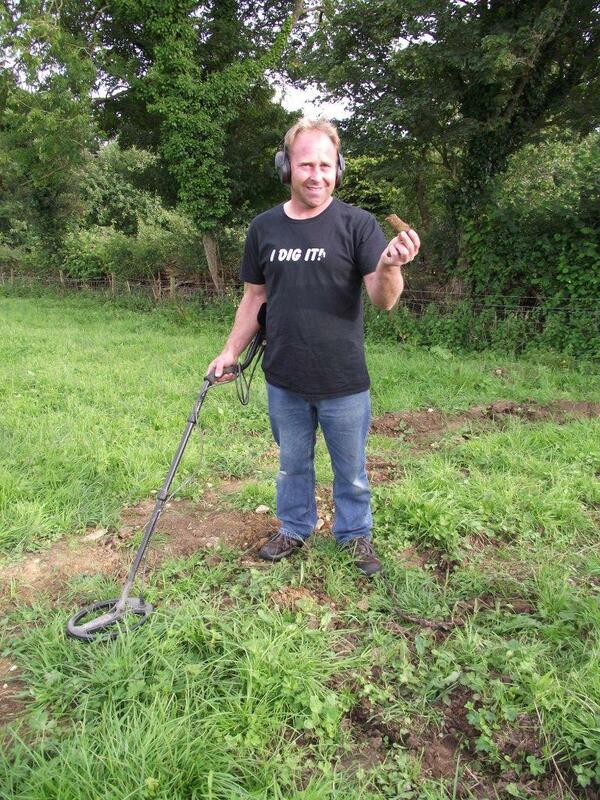 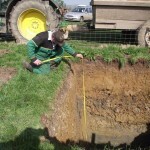 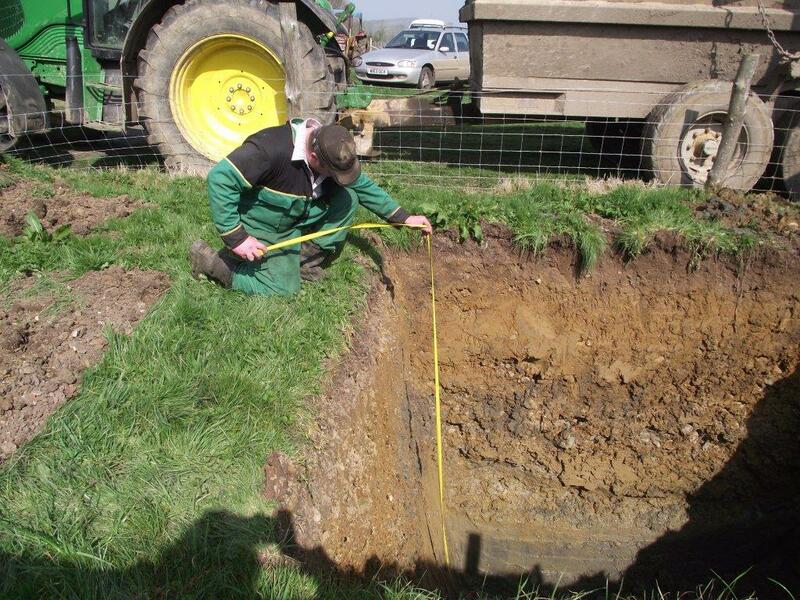 They are anxious to do some detecting in one of our other fields which has recently been ploughed. 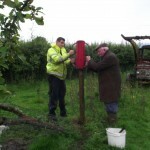 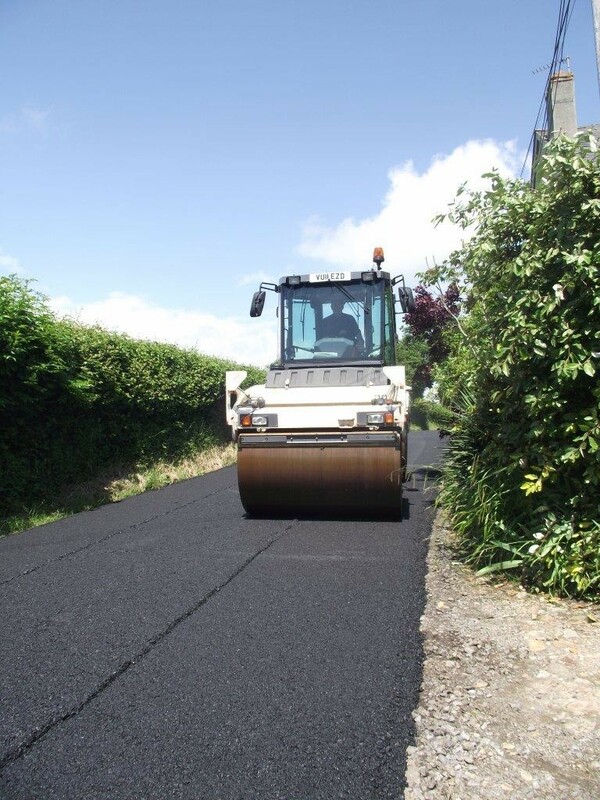 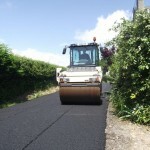 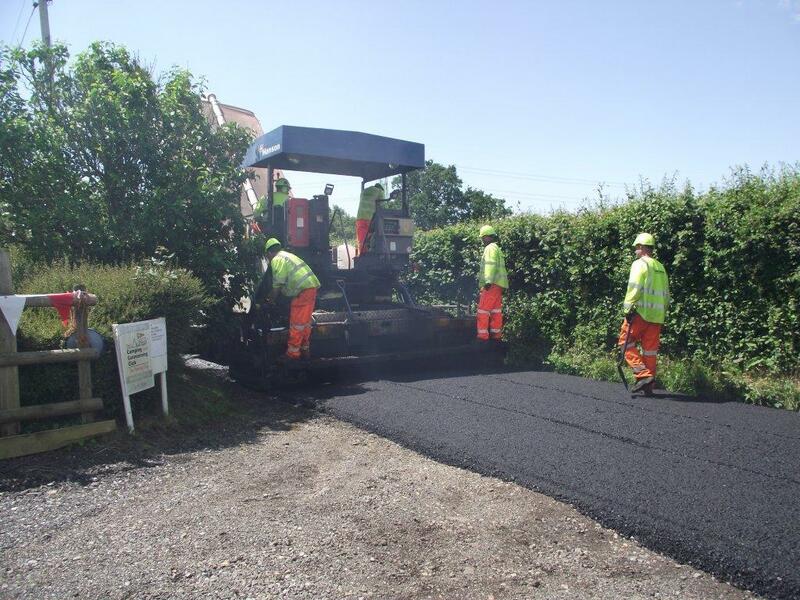 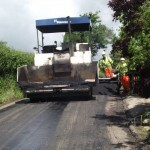 During the summer the local council tarmacked a lot of the local lanes in the Marshwood Vale. 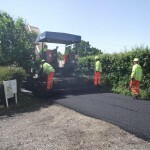 In some places they scraped off the old tarmac and I was lucky enough to get some of these road planings for my campsite. 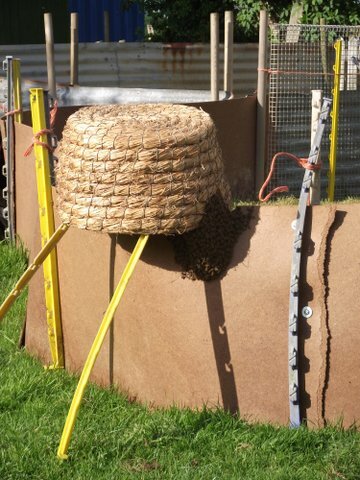 Already the transformation between the top picture and the bottom are incredible! 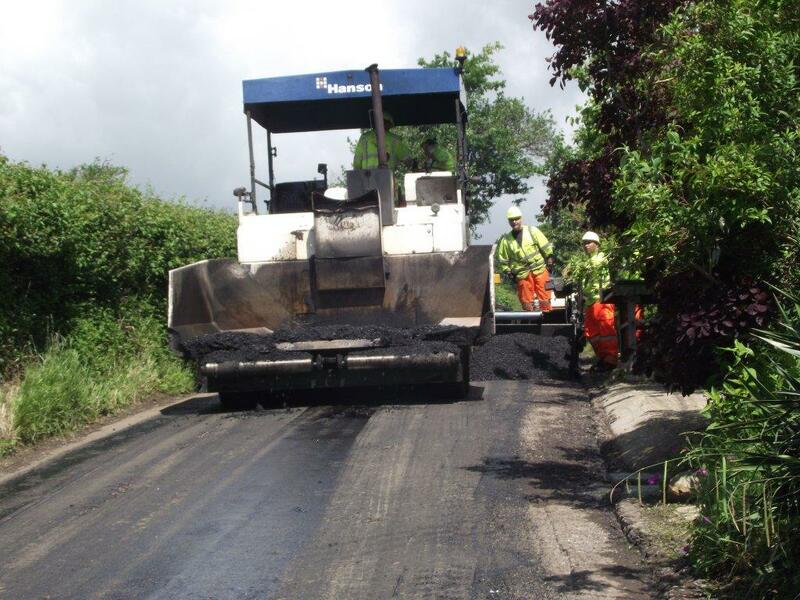 Did you use tarmac plainings for the road?